Attempts to treat facial fractures were recorded in the 25-30 centuries BC. The Smith Papyrus is likely the first document in which treatment of several types of zygomatic fractures are described. In 1751, du Verney described the anatomy, type of fractures observed, and approach to reduction in two cases. Recognizing the importance of reduction for proper healing, du Verney took advantage of the mechanical forces of the masseter and temporalis muscles on the zygoma in his approach to closed reduction techniques. In 1906, Lothrop was the first to describe an antrostomy reaching the fractured zygoma through a Highmore antrum below the inferior turbinate. This allowed for rotation of the fractured zygoma upward and outward for a proper reduction. This transantral approach is known today as the Caldwell-Luc approach. This method avoids external incisions, with access to the maxillary sinus for drainage and for debridement of pulverized bone and mucosal debris. In 1909, Keen categorized zygomatic fractures as those of the arch, the body, or the sutural disjunction. He was the first to describe an intraoral approach to the zygomatic arch via a gingivobuccal sulcus incision. In 1927, Gillies was the first to create an incision made behind the hairline and over the temporal muscle to reach the malar bone. Gillies further described the use of a small, thin elevator that is slid under the depressed bone enabling the surgeon to use the leverage of the elevator to reduce the fracture. The Gillies method remains in use today to elevate the arch. See the image below. Adams recognized the need for greater stabilization in more comminuted fractures and was one of the first to write of internal wire fixation. This technique, described by Adams in 1942, remained the mainstay treatment at many institutions for years. A study performed by Dingman and Natvig demonstrated that many zygoma fractures treated with a closed reduction technique and then later re-examined were more severe than they had appeared clinically or by roentgenographic evaluation. It appeared that although the fracture was reduced at one point, the bone became displaced again because of extrinsic forces. Therefore, they concluded that most displaced fractures of the zygoma should be treated by open reduction and direct wire fixation. Other advocates of internal wire-pin fixation were Brown, Fryer, and McDowell. In their publication in 1951, they described the use of Kirschner wires, either alone or in combination with direct wiring, for the purpose of stabilizing middle-third facial fractures. Osteosynthesis became a reality for facial fractures in the 1970s. The Swiss AO group and Association for the Study of Internal Fixation developed miniplate fixation. The success of miniplates was supported further by Michelet et al and others, who continued to develop techniques for reduction and fixation of facial fractures using miniplates. For unstable, displaced fractures of the zygoma, miniplates were found to efficiently stabilize the bones with minimal complications. The complications noted were attributed to surgical technique rather than the plating system. One can appreciate readily that the treatment of facial fractures has progressed. This article discusses the most current methods of diagnosis and treatment of zygoma fractures. The integrity of the zygoma is critical in maintaining normal facial width and prominence of the cheek. The zygomatic bone is a major contributor to the orbit. From a frontal view, the zygoma can be seen to articulate with 3 bones: medially by the maxilla, superiorly by the frontal bone, and posteriorly by the greater wing of the sphenoid bone within the orbit. From a lateral view, one clearly can see the temporal process of the zygoma join the zygomatic process of the temporal bone to form the zygomatic arch. Attached to the zygoma anteriorly are the zygomaticus minor and major muscles, as well as part of the orbicularis oculi muscle. 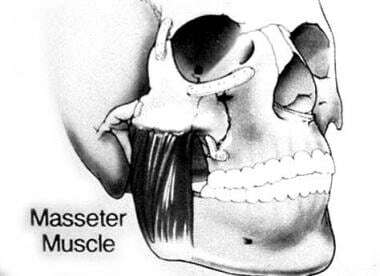 Laterally, the masseter muscle from below attaches to the zygomatic arch and produces displacing forces on the zygoma. See the image below. Three principal buttresses need to be considered in midface fractures. The medial or nasomaxillary buttress reaches from the anterior maxillary alveolus to the frontal cranial attachment. The second is the pterygomaxillary or posterior buttress, which connects the maxilla posteriorly to the sphenoid bone. The third is the lateral or zygomaticomaxillary buttress. This important buttress connects the lateral maxillary alveolus to the zygomatic process of the temporal bone. These buttresses help give the zygoma an intrinsic strength such that blows to the cheek usually result in fractures of the zygomatic complex at the suture lines, rarely of the zygomatic bone. Fracture lines usually run through the infraorbital rim, involve the posterolateral orbit, and extend to the inferior orbital fissure. The fracture line then continues to the zygomatic sphenoid suture area and on to the frontozygomatic suture line. All zygomatic complex fractures involve the orbit, making visual complications a frequent occurrence. Another important landmark with respect to zygomatic fractures is the sphenozygomatic junction (especially laterally displaced fractures). The alignment of the zygoma with the greater wing of the sphenoid in the lateral orbit is critical for determining adequate reduction of zygomatic fractures. Reducing the 3 points that make up the buttresses also helps ensure proper alignment of the zygoma and proper reduction of other facial fractures present. This graduated approach helps preserve facial height and width. Lastly, the branches of the fifth and seventh cranial nerves lie within the bounds of the mid face. Particularly, the temporal and zygomatic branches of the seventh nerve and the zygomaticotemporal and zygomaticofacial branches of the fifth nerve must be identified carefully upon surgical dissection of the area to prevent complications of paresis and paresthesias, respectively. Group I encompassed fractures with no significant displacement. While fracture lines may be evident on imaging, their recommendation was observation and soft diets. Group II fractures include isolated arch fractures. Fracture is indicated when trismus or aesthetic deformities are present. A study by Pozatek et al concurred with the findings of Knight and North except for group V fractures. This group was found to be unstable in 60% of cases. Dingman and Natvig studied patients who were treated by closed methods of zygomatic elevation. In a significant number of patients, they found concomitant fractures along other suture lines and within the orbit after exposing the site through a brow or lower lid incision. They postulated that these fractures were overlooked because of the edema and hematomas present at the time of evaluation and reduction. A significant number of patients suffered from displacement of the zygoma after reduction without fixation. This displacement recurrence may occur because of masseteric displacing forces. Lund found that all group III fractures were stable after reduction, disagreeing with the findings of Knight and North. It now seems apparent that displaced fractures require open reduction and fixation. Manson and colleagues have proposed a more modern classification system in which CT scan is used to assess and classify zygomatic fractures. CT provides information about facial structures, including both bone segmentation and displacement, allowing for complete repair of the fractures. This system divides fractures into low-energy, medium-energy, and high-energy injuries. Low-energy zygoma fractures result in minimal or no displacement. These types of fractures often are seen at the zygomaticofrontal suture, and inherent stability usually obviates reduction. Middle-energy zygoma fractures result in fractures of all buttresses, mild-to-moderate displacement, and comminution. Often, an eyelid and intraoral exposure is necessary for adequate reduction and fixation. High-energy zygoma fractures frequently occur with Le Fort or panfacial fractures. The zygomatic fractures often extend through the glenoid fossa and permit extensive posterior dislocation of the arch and malar eminence. A coronal exposure, in addition to the oral and eyelid incisions, usually is necessary to properly reposition the malar eminence. While 2-point fixation of zygomatic fractures may be used commonly, it often leaves an axis of rotation for the zygoma following an adequate reduction. Forces such as the masseter muscle often displace the zygoma postoperatively. Thus, making the diagnosis and then choosing the correct approach to establish 3-point fixation and ultimate stability is essential for obtaining a successful outcome. Since biomechanical properties are of primary importance underlying the treatment of zygoma fractures, a brief discussion is warranted. Primary bone healing allows quicker and stronger healing of a fracture than callous healing. A study by Lin et al reported that rigidly fixated bone grafts maintain their position and volume better than mobile grafts. Furthermore, rigid fixation helps the bone heal by primary processes rather than by fibroelastic processes. In terms of postoperative stability of a reduced zygoma fracture, 3-point fixation is undoubtedly best. However, at times, 2-point stabilization is perfectly adequate. Some biomechanical models predict downward, backward, and medial rotation of the zygoma with 2-point alignment. Furthermore, the superiority of miniplates over interfragmentary wiring is observed only when fewer points of fixation are used. In this study, the authors found that one miniplate could be used as effectively as 3 points of wire fixation. However, only 5 kg of force were used in the study (normal sustained forces of up to 50 kg are seen in vivo). In a study by Rinehart et al, mechanical loads that better approximate the actual sustained forces observed physiologically were used. Deforming forces of this magnitude require at least 2 miniplates (with 1 miniplate stronger than 3 points of wire fixation and slightly weaker than 3 plates). In a retrospective study by Rohrich et al, rigid miniplate fixation achieved consistently better malar and global symmetry than did interosseous wires. Furthermore, fewer complications occurred, including infraorbital nerve sensory abnormalities. Long-term experimental studies demonstrate that miniplates maintain the osseous volume of bone grafts and prevent nonunion at bone graft contact points better than wires. Rigid fixation with plates and screws is the best form of bony fixation; it restores 3-dimensional stability and allows for the least amount of motion between ends of fragments, the main cause of bone resorption and instability. Presently, several types of microplating systems are available to choose from when rigid fixation is needed for stabilization. A study by Gosain et al directly compared titanium plates with biodegradable plate and screws and cyanoacrylate glue fixation systems. Titanium miniplates were the strongest in distraction and compression across a central gap. However, in many situations, resorbable plates and screws are believed to be adequate. Such situations may include the presence of primarily compressive forces of relapse and sturdy bone fragments that can be fixed in direct contact, since forces of relapse are absorbed by bone fragments and not the fixation system. Resorbable plates and screw fixation systems can be used when standard titanium midface and microplate systems are believed to be adequate. Resorbable plates fixed with cyanoacrylate glue may be used if forces of relapse are primarily compressive and titanium midface or microplate and screw fixation systems are believed to be adequate. Although isolated zygomatic complex (ZMC) fractures occur, fractures of this nature are usually associated with other facial skeletal and soft-tissue injury. Initially, assessment of a zygomatic fracture in an emergent setting should be directed at prevention of life-threatening complications including major bleeding, airway compromise, aspiration, and identification of other fractures. Cervical spine injury should always be considered if the injury is the result of a high velocity event or if the patient has altered mental status. Intracranial, thoracic, extremity, and pelvic injuries require proper evaluation and management. Once other more pressing injuries have been dealt with and the patient is stable, a thorough preoperative assessment of facial skeletal architecture can be performed. Symptoms include paresthesias in the distribution of the maxillary branch of the trigeminal nerve, trismus, diplopia, and flattening of the zygoma. Signs classically include subconjunctival and periorbital hemorrhage and hypesthesias in the distribution of the maxillary branch of the trigeminal nerve. Flattening of the malar eminence, lateral canthal dystopia, and reduction in mandibular movement may be present. Ipsilateral epistaxis and buccal sulcus hematomas may occur. Reduced extraocular muscle function, diplopia, and enophthalmos can occur secondary to orbital floor fractures, resulting in entrapment of orbital contents. A thorough ophthalmologic examination is required to evaluate and document ocular status. If a ruptured globe, retinal detachment, or traumatic optic neuropathy exists, treatment of these supersedes repair of a ZMC fracture. Since mandibular fractures are most often associated with ZMC fractures, tooth roots can be injured, necessitating a thorough intraoral examination. Noncontrast computed tomography (CT) scanning with three-dimensional reconstruction is most commonly used to confirm the presence of a fracture and optimize presurgical planning. Nonetheless, combining ultrasonography with CT scanning allows for excellent visualization of fractures, leading to maximal perioperative planning and repair. Optimal repair of isolated zygomatic arch fractures is within 72 hours of the injury. Within this time frame, the arch is easily reduced without the need for internal fixation or external splints. Arch fractures resulting in decreased mandibular motility can be dealt with via a Gillies temporal approach or supraorbital approach described by Dingman and Natvig in 1964. The temporal approach allows for surgical reduction of a depressed zygomatic arch while leaving a well-camouflaged scar within the hairline. Dissection exposes the deep temporalis fascia followed by creation of a plane between the fascia and temporalis muscle. The lateral eyebrow incision of the supraorbital approach allows for additional access to the frontozygomatic suture line. A supraperiosteal dissection plane allows for access to the arch. Both approaches provide safe and direct access to the zygomatic arch, since the seventh cranial nerve lies above the dissection planes. An instrument such a Rowe zygomatic elevator or Kelly clamp is placed beneath the arch. Once the instrument is properly positioned, the arch is elevated in a superolateral vector taking care to not use surrounding facial bones as a fulcrum. Proper placement of the instrument can be confirmed with palpation by the surgeon's free hand placed within the intraoral, posterior buccal sulcus. A cracking sound is heard when the convexity of the arch is restored with full reduction. The surgeon should be cognizant of the normal flattening of the middle of the arch. A persistent protuberance will occur if care is not taken not to avoid fracture overcorrection. The wounds are closed, and the patient is advised to avoid direct contact to the area for several weeks. A less popular buccal sulcus approach can used. Masseter muscle bleeding may occur along with ocular insult if the instrument is placed too high. Studies by Kobienia et al of intraoperative portable fluoroscopy have demonstrated improved results with the use of a temporal or supraorbital approach for arch fractures. Fluoroscopy allows for visualization of the arch and confirmation of fracture reduction, reducing the need for postoperative CT scanning in patients with isolated zygomatic arch fractures. Various approaches to ZMC fractures have been well described in the literature. These include coronal,  eyebrow, upper eyelid, transconjunctival [20, 21] and infraciliary lower eyelid, and maxillary vestibular approaches. The approach to the ZMC is dictated by the degree of injury and need for exposure for open reduction and internal fixation. Many materials, both autogenous and allogenic, are used for plating. Description of these materials is beyond the scope of this article. Typically, miniplating systems are used for fixation. 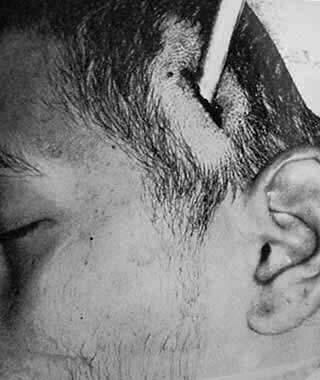 When fixating the frontozygomatic suture, the plates should be placed posterior to the orbital rim to avoid prominence and easy palpation by the patient. The author has used an AlloDerm overlay to reduce visibility and palpability of orbital rim fixation devices. Fractures of the zygomatic complex frequently result in sensory disturbances in the infraorbital nerve distribution. These symptoms include dysesthesia of the skin of the nose, cheek, lower eyelid, upper lip, gingiva, and teeth of the affected side. These arise because fractures generally occur in the vicinity of the infraorbital foramen and canal. This incidence can range from 50-94% with long-term dysfunction of 20-50%, depending on the technique of sensory measurement. Several authors have noted significant improvement in sensory function after open reduction and internal fixation with plates versus a closed reduction technique. [29, 30, 31, 32] This does not make infraorbital nerve dysfunction after a nondisplaced zygoma fracture a sole indication for exploration and decompression, since sensory function returns in most patients. Trismus is also a common finding (45%), particularly after a fracture involving the zygomatic arch. It results from impingement upon the coronoid process of the mandible by a depressed zygomatic arch. This may indicate a need for elevation of the depressed arch, accurate reduction, and fixation. If new bone has formed in the space below the zygomatic arch and restricts the movement of the mandible, an intraoral approach for coronoidectomy may be required to permit mandibular movement. A symptomatic diplopia associated with a positive forced duction test and CT evidence of entrapped muscle or soft tissue with no improvement over 1-2 weeks may be an indication for surgery. When diplopia is associated with enophthalmos, an improvement in vision can be predicted after correction of the enophthalmos. Diplopia associated with zygomatico-orbital fractures may persist longer, and young patients may recover more slowly than adults. A study of over 1000 patients by Zingg et al (1992) demonstrated a 3-4% incidence of acute enophthalmos. The eye is supported by intramuscular cone fat, a network of intraorbital ligaments, and the bony orbit. The displacement of orbital contents into an enlarged bony orbit with subsequent change to a more spherical orbital soft-tissue shape is thought to be the principal underlying mechanism behind the development of enophthalmos. The most common causes of enophthalmos include the failure to properly reduce displaced zygoma fractures and malunited zygoma fractures. Blowout fractures of the orbit, especially those of the medial wall and those of floor fractures behind the axis of the globe, and high-velocity comminuted fractures involving combinations of lateral wall, posterior floor, and medial wall fractures are other causes of enophthalmos. Other theories of possible causes of enophthalmos include fat atrophy, soft-tissue contracture, and fibrosis. Before surgical correction of enophthalmos, examine the patient to assess visual function, extraocular eye movement, and the sensory function of the infraorbital nerve. Both thin coronal and axial slices on CT scans are helpful in determining the extent of orbital damage. While an infrequent occurrence, infection is a problem that threatens all postoperative patients. A study by Zachariades et al of 223 patients treated with rigid internal fixation of facial bone fractures reported that interosseous wiring resulted in a greater rate of infection when compared to bone plates. While 4.5% of patients suffered from both late and early infection, only 0.8% of infections were located in the mid face. Sinusitis has been found to be the most common type of infection seen in postoperative patients; preseptal cellulitis and dacryocystitis also can occur. Since microplate development in the late 1980s, wire fixation techniques have been used less in zygoma fractures. However, no matter how well these plates and screws work, occasions exist in which their removal is required. The usual cause is a palpable plate, although a pain syndrome may occur. More rarely, infections may occur. Very rarely, screws can fracture into bone and create problems for removal. These problems may be limited by a broad availability of drill sizes for use in thin or dense bone. In a review of 55 patients who had internal fixation devices removed after many types of craniomaxillofacial surgery, including trauma, Orringer et al found palpable plates and screws to be the most common reason (35%), followed closely by pain, infection, or loosening of the fixation device (approximately 25%). The authors' experience with complications of fixation of zygoma fractures is limited mainly to palpable plates and screws at the frontozygomatic suture and infraorbital rim. Zygomatic complex (ZMC) fractures remain the most common facial fracture behind nasal fractures. Advances in imaging, surgical technique, and materials for fixation have allowed for improved functional and aesthetic outcomes. Lothrop HA. Fractures of the superior maxillary bone caused by direct blows over the malar bone. Boston Med Surg. 1906. 154:8. Keen WW. Surgery: Its Principles and Practice. Philadelphia: WB Saunders; 1909. Gillies HD, Kilner TP, Stone D. Fractures of the malar-zygomatic compound: With a description of a new x-ray position. Br J Surg. 1927. 14:651-6. Dingman RO, Natvig P. Surgery of Facial Fractures. Philadelphia: WB Saunders Co; 1964. Brown JB, Fryer MP, McDowell F. Internal wire-pin stabilization for middle third facial fractures. Surg Gynecol Obstet. 1951. 93:676. Michelet FX, Deymes J, Dessus B. Osteosynthesis with miniaturized screwed plates in maxillo-facial surgery. J Maxillofac Surg. 1973 Jun. 1(2):79-84. [Medline]. Sicher H, DeBrul EL. Oral Anatomy. 5th ed. St. Louis: Mosby; 1970. 78. Knight JS, North JF. The classification of malar fractures: An analysis of displacement as a guide to treatment. Br J Plast Surg. 1961. 13:325. Pozatek ZW, Kaban LB, Guralnick WC. Fractures of the zygomatic complex: an evaluation of surgical management with special emphasis on the eyebrow approach. J Oral Surg. 1973 Feb. 31(2):141-8. [Medline]. Lin KY, Bartlett SP, Yaremchuk MJ, et al. The effect of rigid fixation on the survival of onlay bone grafts: an experimental study. Plast Reconstr Surg. 1990 Sep. 86(3):449-56. [Medline]. Rinehart GC, Marsh JL, Hemmer KM, et al. Internal fixation of malar fractures: an experimental biophysical study. Plast Reconstr Surg. 1989 Jul. 84(1):21-5; discussion 26-8. [Medline]. Rohrich RJ, Watumull D. Comparison of rigid plate versus wire fixation in the management of zygoma fractures: a long-term follow-up clinical study. Plast Reconstr Surg. 1995 Sep. 96(3):570-5. [Medline]. Gosain AK, Song L, Corrao MA, et al. Biomechanical evaluation of titanium, biodegradable plate and screw, and cyanoacrylate glue fixation systems in craniofacial surgery. Plast Reconstr Surg. 1998 Mar. 101(3):582-91. [Medline]. Menon RP, Chowdhury SK, Semi RS, Gupta V, Rahman S, Balasundaram T. Comparison of ultrasonography with conventional radiography in the diagnosis of zygomatic complex fractures. J Craniomaxillofac Surg. 2016 Apr. 44 (4):353-6. [Medline]. Kobienia BJ, Sultz JR, Migliori MR, et al. Portable fluoroscopy in the management of zygomatic arch fractures. Ann Plast Surg. 1998 Mar. 40(3):260-4. [Medline]. Salentijn EG, Boffano P, Boverhoff J, van den Bergh B, Forouzanfar T. The epidemiological characteristics of zygomatic complex fractures: A comparison between the surgically and non-surgically treated patients. Natl J Maxillofac Surg. 2013 Jul. 4 (2):214-8. [Medline]. [Full Text]. Kharkar VR, Rudagi BM, Halli R, Kini Y. Comparison of the modified lateral orbitotomy approach and modified hemicoronal approach in the treatment of unstable malunions of zygomatic complex fractures. Oral Surg Oral Med Oral Pathol Oral Radiol Endod. 2010 Apr. 109(4):504-9. [Medline]. Rajkumar K, Mukhopadhyay P, Sinha R, Bandyopadhyay TK. 'Y' Modification of the Transconjunctival Approach for Management of Zygomatic Complex Fractures: A Prospective Analysis. J Maxillofac Oral Surg. 2016 Mar. 15 (1):45-51. [Medline]. [Full Text]. Cortese A, D'Alessio G, Brongo S, Gargiulo M, Claudio PP. Management of Zygomatic Fractures in Young Patients: Technical Modifications for Aesthetic and Functional Results. J Craniofac Surg. 2016 Nov. 27 (8):2073-7. [Medline]. Zhuang QW, Zhang XP, Wang X, et al. Coronal approach to zygomaticomaxillary complex fractures. Eur Rev Med Pharmacol Sci. 2015. 19 (5):703-11. [Medline]. Yu H, Shen G, Wang X, Zhang S. Navigation-guided reduction and orbital floor reconstruction in the treatment of zygomatic-orbital-maxillary complex fractures. J Oral Maxillofac Surg. 2010 Jan. 68(1):28-34. [Medline]. Schramm A, Suarez-Cunqueiro MM, Rücker M, Kokemueller H, Bormann KH, Metzger MC, et al. Computer-assisted therapy in orbital and mid-facial reconstructions. Int J Med Robot. 2009 Jun. 5(2):111-24. [Medline]. McGalliard RJ, Kimpton J, McLeod NMH. Ophthalmic outcomes of fractured zygomas. Br J Oral Maxillofac Surg. 2017 May. 55 (4):363-6. [Medline]. Song SH, Kyung H, Oh SH, Kang N. Fixation of fractured anterior wall of maxillary sinus using fibrin glue in a zygomaticomaxillary complex fracture. J Craniofac Surg. 2014 May. 25 (3):919-21. [Medline]. Taicher S, Ardekian L, Samet N, et al. Recovery of the infraorbital nerve after zygomatic complex fractures: a preliminary study of different treatment methods. Int J Oral Maxillofac Surg. 1993 Dec. 22(6):339-41. [Medline]. De Man K, Bax WA. The influence of the mode of treatment of zygomatic bone fractures on the healing process of the infraorbital nerve. Br J Oral Maxillofac Surg. 1988 Oct. 26(5):419-25. [Medline]. Vriens JP, van der Glas HW, Bosman F, et al. Information on infraorbital nerve damage from multitesting of sensory function. Int J Oral Maxillofac Surg. 1998 Feb. 27(1):20-6. [Medline]. Vriens JP, van der Glas HW, Moos KF, et al. Infraorbital nerve function following treatment of orbitozygomatic complex fractures. A multitest approach. Int J Oral Maxillofac Surg. 1998 Feb. 27(1):27-32. [Medline]. Koornneef L. Spatial Aspects of the Orbital Musculofibrous Tissue in Man. Amsterdam and Lisse: Swets and Zeitinglinger; 1977. Barclay TL. Diplopia in association with fractures involving the zygomatic bone. Br J Plast Surg. 1958. 11:47. Zachariades N, Papademetriou I, Rallis G. Complications associated with rigid internal fixation of facial bone fractures. J Oral Maxillofac Surg. 1993 Mar. 51(3):275-8; discussion 278-9. [Medline]. Orringer JS, Barcelona V, Buchman SR. Reasons for removal of rigid internal fixation devices in craniofacial surgery. J Craniofac Surg. 1998 Jan. 9(1):40-4. [Medline].